Extant instructions of DoPT provide that reservation in promotion by non-selection method is available to SCs and STs in all Groups i.e. Group A, B, C & D. In case of promotion by selection method, reservation is available to SCs and STs upto lowest rung of Group A. There is no reservation in promotion by selection within Group A. 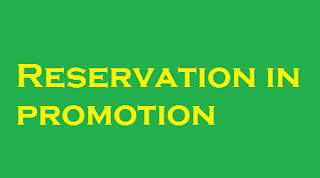 Reservation in posts by promotion under the existing scheme is applicable in which the element of direct recruitment, if any, does not exceed 75%. 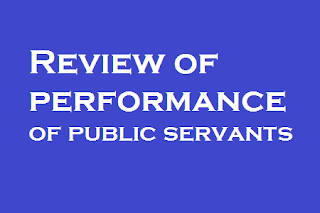 In accordance with Supreme Court judgment dated 15.07.2014, results of Limited Departmental Competitive Examination 1996 for Section Officer grade were revised by UPSC. Appellants, who were declared successful in the modified results of SO LDCE 1996, were included in SOSL 1996 by this Department. Later the benefit was extended to similarly placed SC/ST officers who were declared qualified in the modified results of SO LDCE 1996. On their inclusion in SOSL 1996, these officers have become eligible for consideration for promotion to the next grade (Under Secretary) on completion of eight years of approved service in SO grade i.e. they become eligible for consideration in USSL 2004 onwards subject to the size of the zone. A proposal for review of USSLs 2004 and 2005 has been forwarded to UPSC in which these officers have been included in the zone. This was stated by the Minister of State (Independent Charge) for Development of North Eastern Region (DoNER), MoS PMO, Personnel, Public Grievances, Pensions, Atomic Energy and Space, Dr. Jitendra Singh in a written reply to a question by Shri Ronald Sapa Tlau in the Rajya Sabha today. If he is in Group ‘A’ or Group ‘B’ service or post in a substantive, quasi-permanent or temporary capacity and had entered Government service before attaining the age of 35 years, after he has attained the age of 50 years. (i) in any other case after he has attained the age of fifty-five years”. 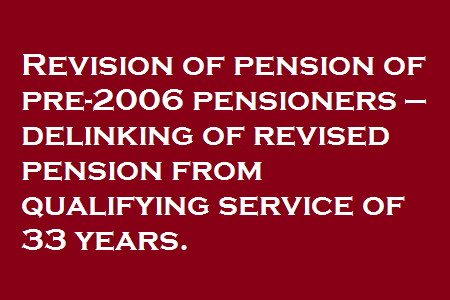 (ii) In addition, as per Rule 48 of CCS(Pension) Rules, 1972, at any time after a Government servant has completed thirty years' qualifying service, he may be required by the appointing authority to retire in the public interest, and in the case of such retirement the Government servant shall be entitled to a retiring pension provided that the appointing authority may also give a notice in writing to a Government servant at least three months before the date on which he is required to retire in the public interest or three months' pay and allowances in lieu of such notice. 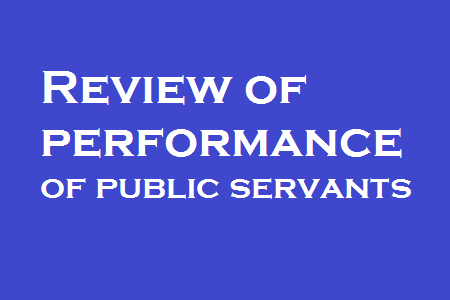 (ii) if the review referred to in (i) or (ii) above has not been conducted, after the review at any other time as the Central Government deems fit in respect of such Member. (iii) The above provisions have been reiterated from time to time and recently vide DoPT’s O.M. No. 25013/02/2005-AIS-II dated 28.06.2012 and 03.08.2015, and O.M. No. 25013/1/2013-Estt.A-IV dated 11.09.2015. Disciplinary cases are conducted as per prescribed procedures. Normally, the details and monitoring of disciplinary cases is to be done by the respective cadre authorities. The Central Government has also from time to time been stressing on the need to complete disciplinary cases expeditiously and monitoring the same. This was stated by the Minister of State (Independent Charge) for Development of North Eastern Region (DoNER), MoS PMO, Personnel, Public Grievances, Pensions, Atomic Energy and Space, Dr. Jitendra Singh in a written reply to a question by Shri Vivek Gupta in the Rajya Sabha today. There is no such proposal at present to link promotion of teachers to performance of students. Recruitment and service conditions of teachers are in the domain of State Governments/UT Administrations. However, The Central Government has a scheme of National Award to teachers to recognize good performance of teachers across the country. School enrolment campaigns are launched by States at the start of the school academic year for awareness generation to enrol out-of-school children in schools and to reach out hitherto un-reached children in remote areas, working children, girls, children belonging to SC and ST communities, and children in difficult circumstances. The performance of students is related to multiple factors including school and home environment. The Central Government has taken various steps to ensure teacher accountability in government and aided schools.
. 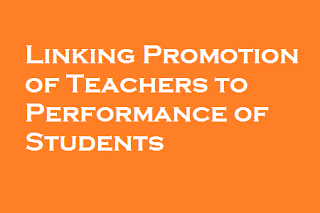 The National Council of Educational Research and Training (NCERT) has developed Performance Indicators for Elementary Education (PINDICS) to track teacher performance and attendance in Government schools. PINDICS have been shared with State Governments/UTs to assess teacher’s performance. Additionally, teachers attendance is being monitored by States/UTs through School Management Committees/School Management Development Committees/ Block Resource Centres/Clusters Resource Centres and in some cases by installing bio-metric attendance system etc. The Central Government has launched the ‘Pandit Madan Mohan Malviya National Mission on Teachers and Teaching’ in December, 2014 with a vision to comprehensively address all issues related to teachers, teaching, teacher preparation, professional development, curriculum design, research in pedagogy and developing effective pedagogy. As per the mandate of the Right of Children to Free and Compulsory Education (RTE) Act 2009, Government of India has notified the National Council for Teacher Education (NCTE) as the Academic Authority at the national level for teacher education and qualification. NCTE has prescribed teacher qualifications for various levels. It has also made it mandatory that all persons holding teacher qualifications as laid down by the NCTE must also pass a teacher eligibility test (TET).These two steps by NCTE are widely seen as efforts to improve the standards of teaching with eventual positive impact on quality of education. This information was given by the Union Human Resource Development Minister, Smt. Smriti Zubin Irani today in a written reply to a Rajya Sabha question. 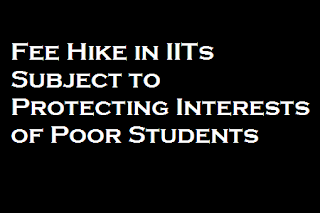 (i) The SC/ST/PH students shall get complete fee waiver. (ii) The most economically backward students (whose family income is less than Rs. One lakh per annum) shall get full remission of the fee. (iii) The other economically backward students (whose family income is between Rs. One lakh to Rs. Five lakh per annum) shall get remission of 2/3rd of the fee. (iv) All students shall have access to interest free loan under the Vidyalaxmi scheme for the total portion of the tuition fee payable. The interests of the socially and economically backward students have been protected adequately, and even furthered in the above dispensation. At present, computerised reservation facility is available at approximately 3337 reservation centers, which are working satisfactorily. Till March 2016, 134 Yatri Ticket Suvidha Kendra (YTSK) licensees have been engaged. They are also working satisfactorily. Next Generation e-Ticketing (NGET) which was launched on 28.04.2014, now has a capacity of booking 15000 tickets per minute and is working satisfactorily. 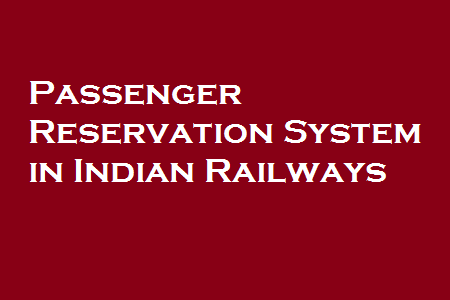 Adequate safeguards have been kept in the computerised Passenger Reservation System (PRS) and internet booking system to prevent its misuse by unscrupulous elements. For the benefit of different categories of travelling public, the Railways have introduced ticketing facilities at Non-Railhead locations and India Post Offices so that the ticketing system can be accessed by people living in smaller towns and villages. This is in addition to e-ticketing which provides access to reservation system from the comfort of the home/office. 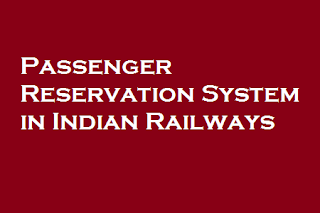 In addition to the provisions made in the computerised PRS and internet ticketing system to prevent misuse of reserved ticketing system, various other steps have been taken, some of which are as under: (i) Condition of carrying original proof of identity by any one passenger booked on a reserved ticket. (ii) Agents are debarred from booking tickets during first thirty minutes of opening of booking, i.e., from 0800 to 0830 hours for general booking, 1000 to 1030 hours and 1100 to 1130 hours for Tatkal booking on AC class and Non-AC class respectively. (iii) In case of booking of reserved tickets through internet, only one booking in one user login session except for return/onward journey between 0800 and 1200 hours. (iv) The monthly limit of booking of tickets through internet by an individual user has now been revised to 6 tickets in a month instead of 10 tickets. This Press Release based on information given by the Minister of State for Railways Shri Manoj Sinha in a written reply to a question in Lok Sabha on 27.04.2016 (Wednesday). The total procurement for three services (Army, Navy and Air Force) for year 2014-15 was Rs. 78753.85 Crores, out of which the procurement from indigenous sources was Rs. 49531.55 Crores. The value of production of Defence Public Sector Undertakings (DPSUs) and Ordnance Factories in the same year was Rs. 46936 Crores. 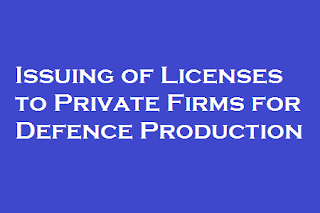 Since the opening of defence manufacturing sector for private sector participation in 2001, so far, 333 Industrial Licenses have been issued by the Government to 201 Indian companies for manufacture of various licensable defence items. 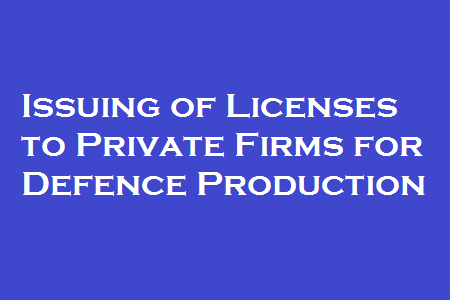 So far 51 Companies, covering 81 industrial licenses, have reported commencement of production. During 2015-16, the Government has issued 75 Industrial Licenses to 56 Indian private companies for manufacture of various defence items. Till date, none of these companies have reported commencement of production. This information was given by Minister of State for Defence Rao Inderjit Singh in a written reply to Shri Harivansh in Rajya Sabha today. Mr.Dorai, one of our genuine reader has highlighted two important crucial issues before the Empowered Committee of Secretaries for implementation. This is a big blunder committed by the VII Pay commission. Whether increase of percentage for annual increment is considered or not, but increment of percentage for promotions definitely need to be implemented to bring the level of monetary benefit to the existing level. 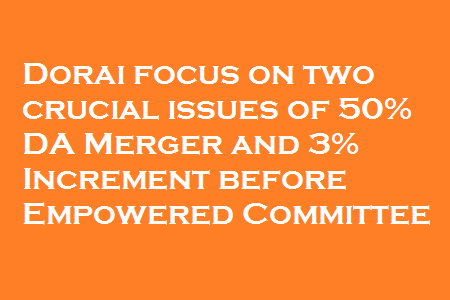 The long standing demand of the central government employees for merger of 50% D.A with basic was not implemented by the government on the excuse that the VI CPC had not made such a proposal. Even the VII CPC is totally silent about this aspect. It appears no one has demanded the same before the VII CPC for consideration. 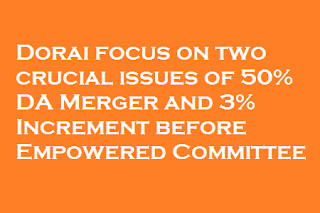 It is quite surprising that such a vital issue of non-recommendation of merger of D.A with basic pay when D.A crosses 50% is not being opposed by any central government associations or pointed out by the media. Had it been recommended by the VII CPC, the government shall definitely implement the same and the benefit of hike in salary as a result of merger of D.A with basic when it cross 50%, would be so vast that no government servant would crave for timely setting up of next VIII Central Pay commission. The flash strike against the recent PF Rules, 2016 of the Central Government (i.e., Centre’s new rule on Provident Fund withdrawal) by large section of Garment Factory Workers and other Industrial Workers of Karnataka State on 18th and 19th April 2016 received immense response and there was a massive protest which resulted in road blocks for hours together, thereby the entire traffic of Bengaluru City was paralyzed. The traffic was also severely affected on Mysore, Tumkur and Hosur roads. The COC Karnataka extended moral support and sympathy for this Labour Movement. The February 10th notification was under attack from trade unions from the beginning. The notification was published in the gazette on February 26 and created technical problems. The violence in Bengaluru prompted the Labour Ministry, Govt. of India to cancel the February 10 notification which put restrictions on 100% withdrawal from the PF account. Within few hours of protest in Bengaluru and other parts of Karnataka state , the Hon’ble Minsiter for Labour, Shri.Bandaru Dattatreya acted upon and withdrawn the notification issued on February 10th and informed that the old system will continue. This is a victory for the workers of the country. This clearly shows that the Government of India does not want to antagonize the workers. If the Central Government employees also participate in trade union action against the retrograde recommendations of the VII CPC similar to the Garment Workers of Karnataka, we too can get similar results and hope for a better wage revision and a decent wage hike. This Labour movement of the Garment Workers of Karnataka state is an eye-opener for all other working class in the entire country, Comrades if one state and one particular working class movement can bring changes to the policy of the Central Government, if the entire the entire country the Central Government employees agitate against the retrograde recommendations of the 7th CPC (where only 14 % wage hike was provided against the staff side demand of 80% wage hike and also reducing the number of allowances and reduction in HRA rates) then the Central Government shall provide the decent wage hike by settling the issue of wage hike with the staff side NJCA like the PF issue being settled. 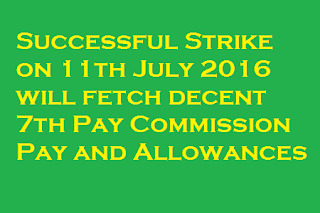 Comrades it is high time to prepare for 11th July strike of Central Government employees under the banner of NJCA. We shall get good results and Central Government shall grant better wage hike than the 7th CPC recommendations. 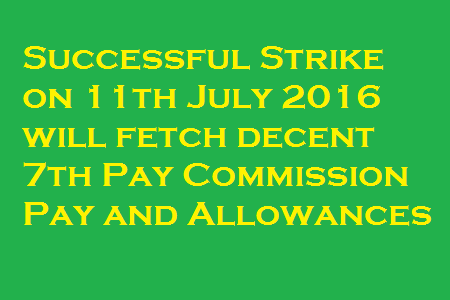 Better we prepare for 11th July strike better wage hike we get. 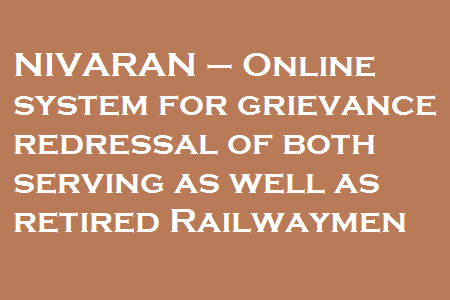 Railway Minister directs to develop an online system for grievance redressal of both serving as well as retired Railwaymen. The system called NIVARAN to come into operation by 24th June, 2016. The System to have provision for progress tracking and appeal. Railway Minister to personally review and monitor the functioning of this system. The move to benefit around 27 lakhs persons. 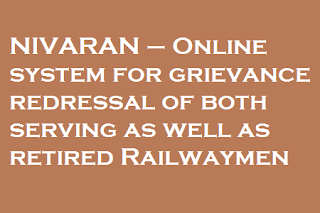 In an innovative measure aimed at staff welfare, Minister of Railways Shri Suresh Prabhakar Prabhu has directed railway administration to develop an online system for the redressal of grievances of Railway Employees both serving as well as retired. The IT Department of Indian Railways has started working on developing this system which will be called “NIVARAN” and will come into operation by 24.06.2016. Under this system, a railway personnel will be able to submit his grievances online and can also track the progress in resolution or disposal of the grievances. The main focus areas of the grievance redressal will be reimbursement of medical claims, pension claim, compassionate appointment and improvement in staff quarters. The move will benefit around 13.26 lakhs serving railway employees and around 13.79 lakhs retired railway personnel that is the system NIVARAN will serve the needs of around total 27 lakhs persons. The Railway Minister has also directed the Railway Administration to create a provision or mechanism in this system for “appeal” against a particular decision of an authority. The Railway Minister has accorded important priority to this new system and has decided to personally review and monitor the functioning of this system. The monitoring and review will also be done at Railway Board Level, at Zonal Level and at Divisional level also. The Railway Minister has always been emphasizing on measures aimed at the welfare of the staff and resolution of their problems. He has always been pointing out the sincerity, dedication and hard work being put in by the railway employees to make Indian Railways as the world class railway system. 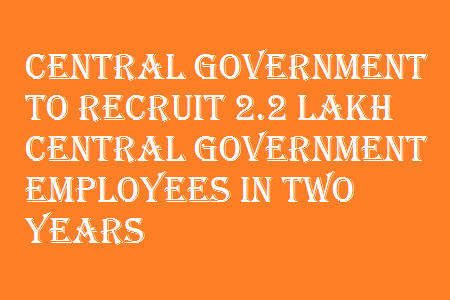 Central government is set to recruit 2.2 lakh central government employees over a period of two years from March 1, 2015, despite the Centre’s announcements from time to time on a freeze in fresh recruitments. The central government’s actual staff on March 1, 2015 was 33.05 lakh, which increased to 34.93 lakh in 2016 and is estimated to grow to 35.23 lakh by March 1, 2017, according to the budget estimates for 2016-17. This includes the railways — which has not added a single worker to its strength of 13,26,437 in the last three years — but excludes the defence forces. The biggest increase of 70,000 is projected in the revenue department which comprises income tax and customs, central excise and service tax, followed by central paramilitary forces, projected to rise by 47,000. The strength of the home ministry, excluding paramilitary forces, has increased by 6,000. The cabinet secretariat, a fairly small department assisting the government, will add 301 employees, going up from 900 in 2015 to 1,201 by March 1, 2017. The I&B ministry added nearly 2,200 personnel in the last two years. The personnel ministry, which manages government staff, added 1,800 jobs in the last two years, the urban development ministry 6,000, mines ministry 4,399 and department of space 1,000. However, the financial allocation for salaries and allowances for the revenue department has not shown any major difference, for the reason that the department has not been able to recruit personnel due to slow progress in the cadre restructuring exercise. Some departments have faced downsizing. Interestingly, there has been a cut in the department of rural development, the focus area of the government, where the strength has come down from 538 in 2015 to 472 in 2016-17. 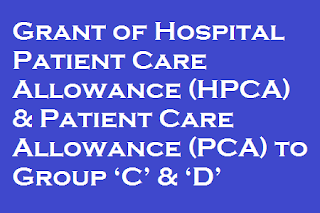 A major reason for the spurt in hiring is that many departments faced acute staff crunch in Group B and C categories due to a moratorium on fresh recruitments for the past several years. A lot of the new appointments have been in these categories. Vacancies have piled up over the years. More than six lakh posts are vacant in various central government ministries, according to the personnel ministry. 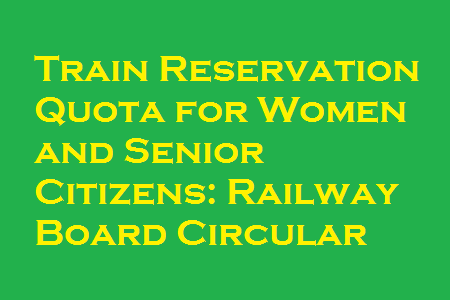 Railway Board Circular on Earmarking of Reservation Quota for Women and Senior Citizens in Sleeper, 2AC and 3AC coaches. 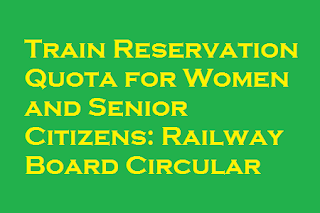 Ministry of Railways has issued a circular earmarking the revised Reservation Quota for Women and Senior Citizens. Sub:Earmarking of Reservation Quota for Women and Senior Citizens. 1.1 The above said. quota in Sleeper class was enhanced to four lower berths per coach vide Commercial Circular No. 51 of 2015 issued on 31.08.2015. No change was, however, made in this quota in 3AC and 2AC classes. 3. It has also been decided that in Rajdhani, Duronto and fully Air Conditioned/Express trains, the number of lower berths to be earmarked under this quota in 3AC class should be 4 lower berths per coach as against 3 lower berths per coach in case of normal Mail/Express trains. 4. Necessary action may be taken accordingly to define this quota from ARP or no booking date whichever is earlier which in no case should be later than 01.09.2016. On Feb 10, 2016, the ministry of labour and employment made sweeping changes in the EPF rules restricting the withdrawal of EPF corpus. 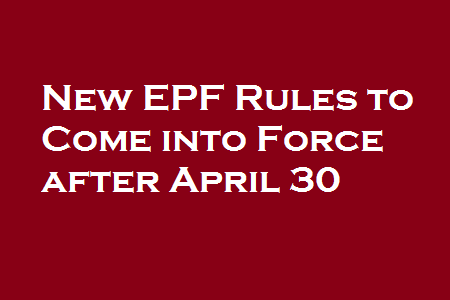 EPFO rules restricting withdrawal of employees’ provident fund will come into force after April 30. 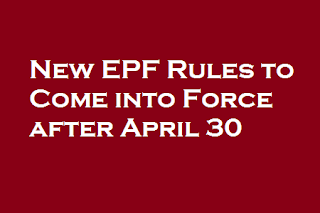 New EPF Rules to Come into Force after April 30 – The government has deferred the implementation of the new rule till April 30, 2016. EPFO rules restricting withdrawal of employees’ provident fund will come into force after April 30. This means that in case you are unemployed for 2 months or more and want to withdraw your full EPF you can do so only within the next 15 days. After that the withdrawal amount will be restricted and you will be able to get the full amount only when you turn 58. On Feb 10, 2016, the ministry of labour and employment made sweeping changes in the EPF rules restricting the withdrawal of EPF corpus. Hitherto, a member of EPFO could withdraw 100% of the accumulated corpus if unemployed for a period of 2 months or more. The accumulated corpus is a sum of employer’s contribution, employee’s contribution and the interest earned on them. Of course, the person needs to have accumulated some EPF in a previous employment to have a corpus to withdraw at all. However, the new EPF rules have restricted the amount of withdrawal that a member can make. Under the new rule, a member after being unemployed for 2 months or more can withdraw only his own contribution and the interest earned on it. He can’t withdraw the corpus generated from the employer’s contribution along with the interest earned on it. A member in the Employees Provident Fund Organisation (EPFO) can withdraw the full Employee Provident Fund (EPF) corpus only after attaining the age of 58 years. So, if you are jobless for 2 months or more and wish to withdraw the full EPF corpus, you just have 15 days to get it out. The government has deferred the implementation of the new rule till April 30, 2016. From May 1, till 58 years of age you can withdraw only your own contribution in EPF which equals 12% of your basic salary plus the interest if unemployed for 2 months or more. The employer’s contribution plus the interest accumulated will be withdrawable only once you attain the age of 58 years. We consider a hypothetical scenario wherein a person after being employed for 20 years becomes jobless in the month of Jan, 2016. Assuming his basic salary as Rs 25000 per month for the whole period his own contribution in EPF would be Rs 3000 per month. If he contributes for 20 years, his own contribution of Rs 7.20 lakh (12%*25000*12*20) will yield him a corpus of ?approximately Rs 19 lakh which includes the interest on his contribution. What’s more, the employer’s contribution of Rs 4.20 lakh will grow to Rs 11.50 lakh approximately which includes the interest component too. In this case, we have assumed an interest rate of 9% per annum compounded yearly for the whole period. As he became jobless in Jan, he is unemployed for a period of more than 2 months as on date. Under the current rule, if he withdraws his EPF corpus before May 1, then he can withdraw the full corpus of Rs 30.5 lakh. However, if he doesn’t withdraw before May 1, he can take out his own contribution and interest of Rs 19 lakh even after this date provided he remains jobless. However, the remaining Rs 11.50 lakh can be withdrawn only after he reaches the age of 58 years. You can however, withdraw 90% of the employer’s contribution plus interest at the age of 57 years. Importantly, the erstwhile rule of zero interest on inoperative accounts was quashed from April 1. Hence the employer’s contribution lying idle in the EPF account till the age of 58 years will continue to earn interest. 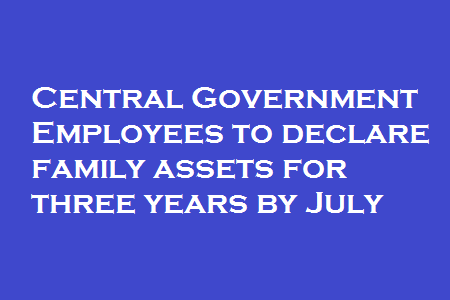 Central government employees were today told to file details of their assets and liabilities, along with that of their spouses and dependent children, as part of mandatory obligations under Lokpal Act by July. The Department of Personnel and Training (DoPT) has asked secretaries of all Central government ministries and chief secretaries of state governments to ensure that employees working under their control file the declarations in time, under its OM No.407/12/2014-AVD-IV(B). The move comes as the deadline for filing of these returns was yesterday extended for the fifth time, till July 31. Employees have to file three declarations–one each for 2014, 2015 and 2016. 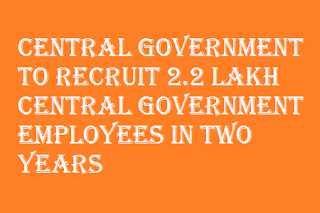 There are about 50 lakh Central government employees. The declarations under the Lokpal law are in addition to similar ones filed by the employees under various services rules. Employees have to give details like cash in hand, bank deposits both in domestic and in foreign, investment in bonds, debentures, shares and units in companies or mutual funds, insurance policies, provident fund, personal loans and advance given to any person or entity, among others. They also have to declare expensive furniture, fixtures, antiques, paintings and electronic equipment if the total current value of any particular asset in any particular category (e.g. furniture, fixtures, electronic equipments) exceeds two months’ basic pay or Rs one lakh. As per rules, notified under the Lokpal and Lokayuktas Act, 2013, every public servant shall file declaration, information and annual returns pertaining to his assets and liabilities as on March 31 every year or on or before July 31 of that year. For 2014, the last date for filing returns was September 15 of that year. It was first extended till December 2014, then till April 30, 2015 and third extension was up to October 15. The date was then extended to April 15, this year for filing of returns for 2014 and 2015. Now it has been extended till July 31, 2016 and employees have to file one returns each for 2014, 2015 and 2016 by this new date. 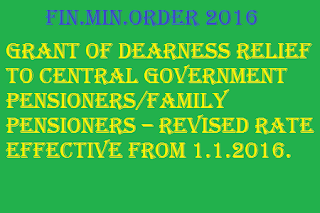 Grant of Dearness Relief to Central Government pensioners/family pensioners – Revised rate effective from 1.1.2016. 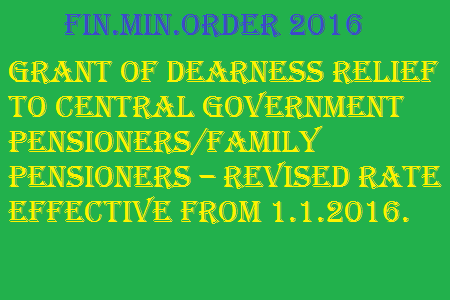 Subject : Grant of Dearness Relief to Central Government pensioners/family pensioners – Revised rate effective from 1.1.2016. The undersigned is directed to refer to this Department’s OM No. 42/10/2014-P&PW(G) dated 28th September, 2015 on the subject mentioned above and to state that the President is pleased to decide that the Dearness Relief (DR) payable to Central Government pensioners/family pensioners shall be enhanced from the existing rate of 119% to 125% w.e.f. 1st January, 2016. 2. These orders apply to (i) All Civilian Central Government Pensioners/Family Pensioners (ii) The Armed Forces Pensioners, Civilian Pensioners paid out of the Defence Service Estimates, (iii) All India Service Pensioners (iv) Railway Pensioners and (v) The Burma Civilian pensioners/family pensioners and pensioners/families of displaced Government pensioners from Pakistan, who are Indian Nationals but receiving pension on behalf of Government of Pakistan and are in receipt of ad-hoc ex-gratia allowance of Rs. 3500/- p.m. in terms of this Department’s OM No. 23/1/97- P&PW(B) dated 23.2.1998 read with this Department’s OM No. 23/3/2008-P&PW(B) dated 15.9.2008. 3. 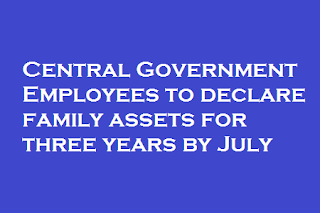 Central Government Employees who had drawn lump sum amount on absorption in a PSU/Autonomous body and have become eligible to restoration of 1/3rd commuted portion of pension as well as revision of the restored amount in terms of this Department’s OM No. 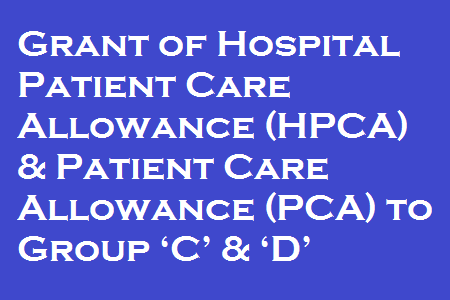 4/59/97-P&PW (D) dated 14.07.1998 will also be entitled to the payment of DR @ 125% w.e.f. 1.1.2016 on full pension i.e. the revised pension which the absorbed employee would have received on the date of restoration had he not drawn lump sum payment on absorption and Dearness Pension subject to fulfilment of the conditions laid down in pars 5 of the O.M. dated 14.07.98. In this connection, instructions contained in this Department’s OM No.4/29/99-P&PW (D) dated. 12.7.2000 refer. 5. Other provisions governing grant of DR in respect of employed family pensioners and re-employed Central Government Pensioners will be regulated in accordance with the provisions contained in this Department’s OM No. 45/73/97- P&PW (G) dated 2.7.1999 as amended vide this Department’s OM No. F. No. 38/88/2008-P&PW(G) dated 9th July, 2009. The provisions relating to regulation of DR where a pensioner is in receipt of more than one pension will remain unchanged. 8. The offices of Accountant General and authorised Pension Disbursing Banks are requested to arrange payment of relief to pensioners etc. on the basis of these instructions without waiting for any further instructions from the Comptroller and Auditor General of India and the Reserve Bank of India in view of letter No. 528-TA, 11/34-80-II dated 23/04/1981 of the Comptroller and Auditor General of India addressed to all Accountant Generals and Reserve Bank of India Circular No. GANB No. 2958/GA-64 (ii) (CGL)/81 dated the 21st May, 1981 addressed to State Bank of India and its subsidiaries and all Nationalised Banks. 10. This issues with the concurrence of Ministry of Finance, Department of Expenditure vide their OM No. 1/1/2016-E.II(B) dated 07th April, 2016. Central Government employees must be wondering why Centre is taking so much time to implement Seventh Pay Commission recommendations. 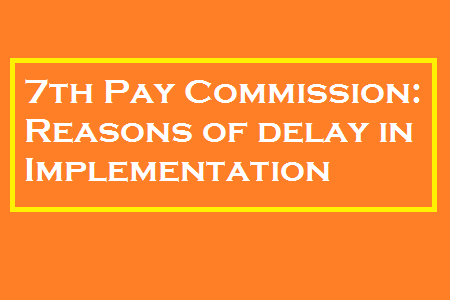 It’s already four months since Pay Commission had submitted its report to Finance Ministry to give final touch to it. Though, Modi Government recently dropped enough hint that it will implement increment process soon, but no particular time frame was given to the Central staff. Here are the possible reasons why Government is taking time to implement the hike. As Rs 1.02 lakh crore is needed to implement whole increment process, Centre needs to have proper strategy for the same. At a time when OROP’s expenditures is already taking toll on the exchequer, pay Commission will put extra burden on the government budget. Government needs to address grievances of various stakeholders including government staff and Army men before taking final call on the same. While Babus are unhappy with minimum basic pay, Defence personnels say that they shouln’t be treated at par with their civilian counterparts in terms of salary and allowances. As model code of conduct is in place, Government doesn’t want to take risk by announcing implementation date. Centre doesn’t want to displease voters at a time when poll process is going on in many crucial states. It is being believed that notification for the ‘increment proposal’ will be issued once State election will be over. 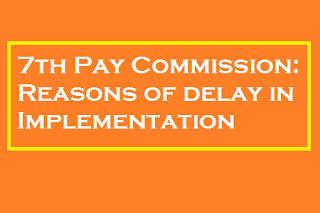 Pay Commission will be implemented after cabinet will give it a final approval. Currently, the Implementation cell of the Empowered Committee of Secretaries is trying to address various issues with it. After giving final touch to the report, Empowered Committee will send recommendations to PMO for its nod. Once PMO will through the report, it will be placed before the Cabinet. 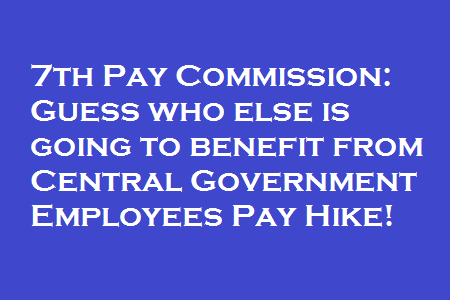 7th Pay Commission: Guess who else is going to benefit from Central Government Employees Pay Hike! 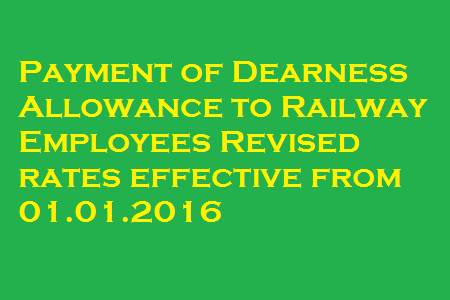 Sub: Payment of Dearness Allowance to Railway employees Revised rates effective from 01.01.2016. Please refer to this Ministry’s letter of even number dated 24.09.2015 PC-VI/356 RBE No.115/2015) on the subject mentioned above. 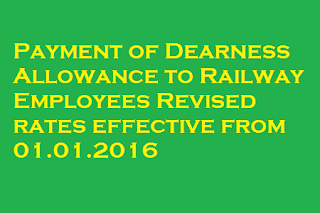 The President is pleased to decide that the Dearness Allowance payable to Railway employees shall be enhanced from the existing rate of 119% to 125 % with effect from January, 2016. 2. The provisions contained in Paras 3, 4 & 5 of this Ministry’s letter of even number dated 09.09.2008 (S.No. PC-V1/3, RBE No 106/2008) shall continue to be applicable while regulating Dearness Allowance under these orders. 3. The additional installment of Dearness Allowance payable under these orders shall be paid in cash to all railway employees. The arrears may be charged to the salary bill and no honorarium is payable for preparing separate bill for this purpose. 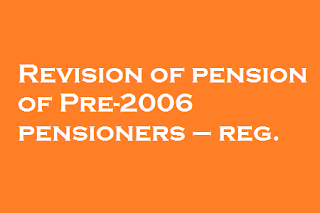 Revision of pension of pre-2006 pensioners — delinking of revised pension from qualifying service of 33 years. 7. Ministry of Agriculture, etc. are requested to bring the contents of these orders to the notice of Controller of Accounts/Pay and Accounts Officers and Attached and Subordinate Offices under them for revising the pension of all those pre – 2006 pensioners who had rendered less than 33 years of qualifying service at the time of retirement in the manner as indicated above on top priority. Revised Pension Payment Orders in all these cases may also be issued immediately. 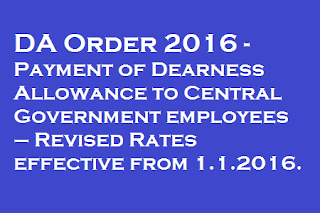 DA ORDER: Payment of Dearness Allowance to Central Government employees – Revised Rates effective from 1.1.2016. Dated the 7th April, 2016. 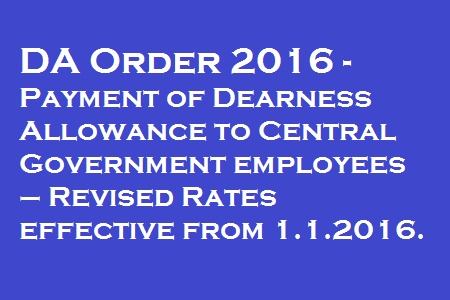 Subject: Payment of Dearness Allowance to Central Government employees – Revised Rates effective from 1.1.2016. The undersigned is directed to refer to this Ministry’s Office Memorandum No. 1/3/2015-E-II (B) dated 23rd September, 2015 on the subject mentioned above and to say that the President is pleased to decide that the Dearness Allowance payable to Central Government employees shall be enhanced from the existing rate of 119% to 125% with effect from 1st January, 2016. 2. The provisions contained in paras 3, 4 and 5 of this Ministry’s O.M. No. 1(3)/2008-E-ll(B) dated 29th August, 2008 shall continue to be applicable while regulating Dearness Allowance under these orders. Since the exercise is believed to have been kicked off at the instance of the Prime Minister’s Office, chances are that several more employees may be shown the door. Compulsory Retirement – Cracking down on CG Employees – While there was always a rule to compulsorily retire bureaucrats, the rule applies to only those who are at least 50 years old. CG employees may get 3-4 times the salaries of their private sector counterparts, especially at the lower-to-medium levels, but the security of tenure that they enjoyed is now under threat because of the compulsory retirement threat. 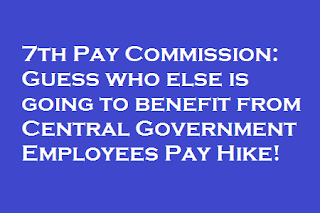 A study for the 7th Pay Commission found a fresh government nurse earned 3.4 times her private sector counterpart, a teacher 2.7 times and a driver 2.3 times. While there was always a rule to compulsorily retire bureaucrats, the rule applies to only those who are at least 50 years old – on grounds of either corruption or inefficiency, this has rarely been used. According to The Economic Times that reported the use of an obscure Rule 56(j) to sack 15 customs and central excise officials —including two at the level of commissioners—this was last invoked three decades ago. Indeed, a few months before it demitted office in 2014, the UPA government reiterated the rule, but it did precious little about it. The NDA reissued the order last September, but made its intentions clear since, while doing so, the order excerpted various Supreme Court judgments on this – in other words, CG employees were warned that the highest court in the land had ruled in favour of this in the past. However, there are enough checks since there will be review panels before the compulsory retirement and then there is the process of appeal to the tribunal as well as to the courts. 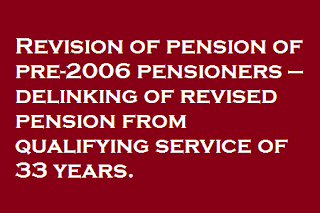 The following questions arises from the recommendations of the 7th pay commission in relation to pensions of pre 01 January 2016 retirees of the defence services. One Rank One Pension – Nipping 7th CPC Anomalies In The Bud – It may be fitting for services HQs and veterans associations to take up these specific issues for rationalization. 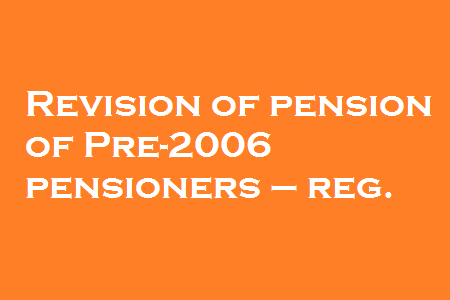 one rank one pension The following questions arises from the recommendations of the 7th pay commission in relation to pensions of pre 01 January 2016 retirees of the defence services. @ Para 10.2.87 (i) of the recommendations mentions “Pay Band and Grade Pay” as a means of first “fixing” at minimum level in the 7th CPC matrix for calculating notional pay of pre 01 Jan 2016 defence retirees. But retirees of pre 01 Jan 2006 era only had a pay-scale and no grade pay to identify with the “levels” of the 7th CPC matrix. How will pre 01 Jan 2006 retirees fix their notional pay in the matrix as Grade Pay and Pay-Bands were introduced only after 01 Jan 2006 by VI CPC? @ Then, the same para goes on to recommend that a retiree should add the number of increments “earned” in that level for arriving at the notional pay. Does that mean the increments actually granted or the number of increments from the last pay drawn counting back to the lowest stage of the pay-scale in which a pre 01 Jan 2006 retiree retired? @ Para 10.2.86 (ii) of the 7 CPC recommendations provides an alternate calculation, viz., of multiplying by 2.57 the pension fixed at time of implementation of VI CPC. But pensioners are already drawing OROP pension with DR at 125%. Thus 2.25 X OROP pension presently being drawn is likely to be higher than the 2.57 X VI CPC pension recommended by 7 CPC. Does that mean 7 CPC will provide a negligible increase, if any, in pensions of defence retirees? @ To take an example, if five increments plus two stagnation increments actually earned by a Lt Col (or equivalent) who retired with, say, 28 to 30 years of service in August 2004 are put in the matrix at “index” of 7, his notional pay will correspond to a Lt Col of post 01 Jan 2006/01 Jan 2016 era with 13+7=20 years of service i.e. 10 years less than the 2004 Lt Col. Even if the Aug 2004 Lt Col retiree is eligible to count total increments on the pay-scale of 13500-400-17100 down from his last pay (with stagnation increments) of 17900/-, the number of increments comes to 12. If that is put in the matrix, in level 12-A, the Lt Col’s notional pay would be fixed at index 12 which corresponds to a current Lt Col with 13+12=25 years of service, which will be about 4 to 5 years less than the actual service put in by the 2004 retiree. Does the 7 CPC intend to do away with the “equal service” clause of OROP in this fashion? It may be fitting for services HQs and veterans associations to take up these specific issues for rationalization. Proposals on Child Care Leave (CCL) and Maternity Leave — Reg. Subject:- Proposals on Child Care Leave (CCL) and Maternity Leave — Reg. (a) Maternity/CCL in case of surrogacy: There is no provision at present for any kind of Leave for surrogate/commissioning mothers. It is proposed that 180 days maternity leave may be granted to the surrogate as well as commissioning mothers, in case either/both of them are Government servants. The commissioning mother also requires time for bonding with her child and to take care of him/her and hence would also become eligible for Child Care Leave. Paternity Leave may also be granted in case of surrogacy. (b) Age Limit for CCL in case of disabled children: It is proposed that the age limit for CCL in case of disabled children needs to be done away with since the requirement of parental care may be more/stronger when the disabled child grows older. It may therefore be allowed to provide for CCL in the case of disabled children — the ‘disability’ being clearly defined by the Ministry of Social Justice & Empowerment – without any age limit provided the maximum CCL that can be availed remains within the ceiling of 730 days. (c) Leaving HQ/availing LTC while on CCL: At present leaving headquarters or availing LTC are not permissible during CCL. The underlying intent of CCL is to allow care of up to two children whether for rearing or to look after any of their needs like examination, sickness etc. Thus, it is not restricted to exam and sickness alone. Taking care may also include ensuring their rest and recreation and towards that objective leaving headquarters or availing LTC can be allowed. It is thus proposed that the employees may be permitted to leave headquarters/avail LTC while they are on CCL, provided clearances from appropriate competent authorities are taken while proceeding on foreign travel. (d) CCL minimum for at least five days: Vide this Department O.M. No.13018/6/2013-Estt. (L) dated 5 th June, 2014 the stipulation of the requirement of minimum period of 15 days’ CCL has been removed. It is now proposed to introduce a minimum period of five days of CCL i.e., CCL henceforth may not be granted for less than 5 days. 2. Comments on the above proposals are solicited please.